What comes to mind when you think of agriculture in San Luis Obispo County? Maybe its cattle grazing on rolling pasture, fields of greens, or a vineyard. I bet that some of you immediately imagined Los Osos Valley. If you’re traveling from one of its nearby towns, you probably know the feeling when you get to Los Osos Valley – “…ahh…” The land really opens up. The valley stretches between San Luis Obispo and Los Osos. The iconic morros on one side and the Irish Hills on the other. It features some of SLO County’s most productive soil. The long-standing farms and ranches in the region are diverse. Everything from leafy greens to avocados, sheep, and cattle are grown in this coastal vale. Come late afternoon, the “air conditioner” kicks on and an inversion layer brings a blanket of fog from the back bay to Terrace Hill. This pocket of SLO is also primed for change. The valley is located between two thriving communities. It is often looked to for conversion from open farm fields and oak-studded canyons to houses on hilltops and subdivisions down below. It’s not hard to imagine this type of change happening quickly and quietly. The area has been the subject of both recent and former plans to expand the towns on either side. What to do with the potential loss of such a unique, productive, and scenic agricultural hub? You work with those who want to protect it the most – the farmers and ranchers that work the land day in and day out, some for generations. Los Osos Valley has been part of The Land Conservancy’s conservation efforts for decades. Thanks to you, we’re on the verge of protecting more than 650 acres in the valley through two conservation easements this fall. One farm features fields of organic ancient grains planted below oak-lined canyons. 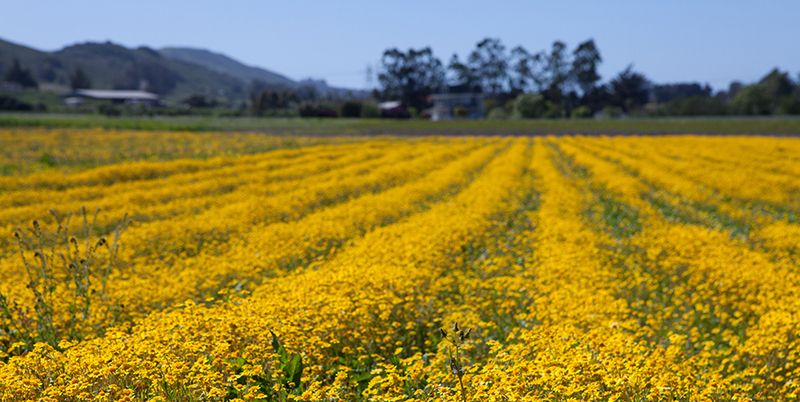 Set just off the road, the farm’s bright flowers and green spring hillsides will always be in view as you make your way toward Los Osos. Another ranch includes the slopes of one of San Luis Obispo’s iconic morros. There, hillside terraces shaded by oak trees create diverse pockets of vibrant plants. Golden eagle and peregrine falcon nest on the rocky summit, and bear and mountain lion are often seen by wildlife cameras as they pass through the ranch. These sights, and so many more, will be part of over 1,600 acres of protected farms and ranches in Los Osos Valley later this fall. Your support for land conservation in our county will mean the permanent protection of productive valley farms and the slopes of a classic coastal peak. So, the next time you find yourself in that “…ahh…” moment along Los Osos Valley, you’ll know that it’s still thriving because of you.